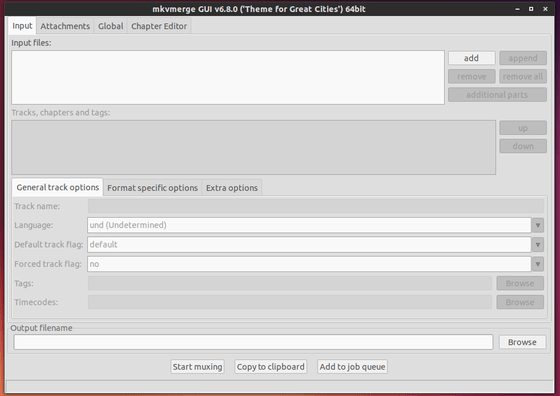 The mkvmerge gui tool MKVToolnix has reached release 6.8.0 recently with tons of bug fixes for the Windows builds and support for h.265/HEVC video. So far the h.265/HEVC support is only for reading it from elementary streams or from other Matroska files. See the changelog. The official website provides the most recent builds for Ubuntu 13.04 Raring, Ubuntu 12.04 Precise and Ubuntu 13.10 Saucy. To download the .deb, go to bunkus.org/ubuntu/ -> select your release code name -> binary -> os type -> download the package. sudo add-apt-repository "deb http://www.bunkus.org/ubuntu/saucy/ ./"
NOTE: in the code change the Ubuntu code name saucy to yours. These commands will add the mkvtoolnix repository, download & import the key, update system package lists and install mkvtoolnix and the gui.